Saturday marked two years since Kyleigh was born and died. It’s hard to fathom that it has been two years, although at times, it seems much longer than that. I realize how long ago two years was when I look at my boys and see how much they have grown up. Our youngest boy was barely 2 years old himself when Kyleigh was born. He asks a lot of questions about her and what happened because he simply does not remember most of the details. Our oldest boy is almost 7, and that just about knocks my socks off! How is it that he is going to be seven years old?! It makes me start to question if I am doing everything I can to provide him what he needs to grow into a young man. It makes me wonder if these last two years have been healthy and positive for him, or if he feels like his life has been turned upside down and will never be the same. I do not write much anymore. There is always plenty to say. There is not always the time, or the right words to say them in. When I sit down to write, I often find my thoughts turning towards the negative and I don’t want this space to turn into my rant of the things that frustrate and disappoint me when it comes to living this life without Kyleigh. So I avoid the blank page and wait until I forget what I was going to write about, or something better comes along. I think Kyleigh’s 2nd birthday is something better and worth writing about. A lot of very positive things are happening in Kyleigh’s name and there has been great progress just within the last month. Knowing that we set up a fund in Kyleigh’s name through the Liberty Hospital Foundation is not news to most of you. Over the last year, the Kyleigh’s Gift Fund has been working on getting the Sleep Sack project off the ground. Originally, the sleep sacks were to be shipped and ready to start passing out to newborns at the first of this year. Weather and holidays caused some delays and it was the beginning of March before the sleep sacks arrived at the hospital. The Foundation invited us to come and check out the sleep sacks before they started to hand them out. We decided to make it a family affair and took the boys with us. When we walked into the Foundation office, they surprised us with the first Kyleigh’s Gift sleep sack. They had it placed in a shadow box, ready for us to display at home. We are excited to get it hung up for all who enter our home to see. The second surprise of the afternoon was the news that they wanted to hold a reception to kick-off the sleep sack project. A few weeks later, family, friends, Liberty Hospital and Liberty Hospital Foundation board members, doctors, nurses and community members came together to see the fruits of the labor of many people. To see the faces of those we know come together to celebrate and remember Kyleigh is one thing, but to see so many new faces from the community learn about Kyleigh, left us speechless. We were so touched by the presence of everyone there. Just a few nights before the reception, the first committee meeting was held for the Kyleigh’s Gift Fund. It was decided by the Foundation to form a committee to start planning and making decisions for the fund. This was great news for us because that means that the fund is growing and gaining momentum. Our first project is to plan a run/walk fundraiser for October 11, 2014. Save the date! There is a lot more going on behind the scenes. We have been interviewed by the hospital for an upcoming publication and could possibly be speaking at a LH Foundation event this summer. When we started the Kyleigh’s Gift fund two years ago, we never imagined it would reach this stage in just two short years. There is something special about seeing Kyleigh’s name in print … on each sleep sack that goes home with new families … on the card that explains the meaning behind the sleep sacks … on newsletters distributed by the Foundation. There is no way that we could have done this on our own and we are so grateful for the Liberty Hospital Foundation and all of the work that they have done and continue to do to help us share Kyleigh with others. But here’s the thing. All of this does not take away the pain. Walking into a patient’s room at the Liberty Hospital Birthing Center and seeing a Kyleigh’s Gift Sleep Sack sitting on the table waiting for the next mom and baby to arrive does not take the pain away. It creates a very bittersweet moment. It creates a moment of excitement that we did this! Kyleigh did this! But wait. Kyleigh isn’t here to witness it. We are doing this because Kyleigh is gone. There would have been no reason to start a fund in her name had she lived. The emotions that all of this creates at one time is simply overwhelming. Having the Kyleigh’s Gift Fund has helped us in our grief. It gives us something to focus on that is specific to Kyleigh. This is how we parent her, if you will. We want to honor, celebrate and remember Kyleigh the best that we can. This is how we are choosing to do just that. But the grief is still there. We miss her and we always will. I think there is a misconception among most people that when you turn a tragedy into something good (like I think we are doing), then the tragedy slowly fades … disappears. People assume that since you have something to focus on, you are no longer sad. People assume that you have moved on because your mind has shifted to planning events in memory of your loved one instead of focusing on the tragic event itself. People assume that there are no more tears because they see you smiling and laughing. We still have days of sadness. We will never move on. We still cry. Our hearts are lifted when a friend brings us dinner the week of Kyleigh’s birthday. We smile when children make Kyleigh birthday cards. We cry happy tears when a dear friend writes a note telling us how she will never forget Kyleigh. We feel blessed when loved ones join us to celebrate, whether it is the unveiling of the sleep sacks or at the park for Kyleigh’s birthday. We feel loved when people acknowledge not only our daughter, but also our pain. We spent Saturday morning watching the boys play soccer. They were excited from the moment they woke up because it was Kyleigh’s birthday. I think this gave them a little extra motivation during their game. Afterwards, we met family and friends at a local park to enjoy lunch and birthday cake. It was very laid back, as we even asked everyone to bring their own lunch. We knew those that we invited would not be offended. It was a beautiful, sunny day and I know Kyleigh was shining down on us as we sang ‘Happy Birthday!’ After three and a half hours at the park, we were tired, so we headed home for some rest. That evening, the four of us went to my parent’s house for dinner, where we just simply relaxed. It’s so nice to have a place to go where we can just ‘be’ and there are no expectations. After church on Sunday, we took the boys to the cemetery to lay some fresh flowers and release two balloons. Overall, it was a nice weekend and we are happy with how we chose to celebrate Kyleigh’s birthday this year. One thing that we have agreed on is that we will celebrate her birthday every year. We don’t know how or when it will happen each year. All we know is that our daughter deserves to be remembered … especially on her birthday. “I’ll sleep tomorrow,” I told myself and others, in the days immediately following Kyleigh’s birth. The classic advice given to all new parents (get your sleep now) certainly applied to me too, but little did I realize that my new found perspective would continue for another 24 months. As it continues still today. Tomorrow took the form of planning Kyleigh’s celebration of life, caring for family at home and hardest yet was living with my own grief. We slept at night of course, but there is a very real toll that grief takes on the body, and we were tired. I piled onto this my decision to be more assertive at work, which took up more time and energy. But at the time that was ok, because I could always sleep tomorrow. We built a new technology which required a deeper understanding of my profession and I was behind. I had worked for the same employer for six years, but I still needed to know more. During the project, I took time to learn, ask questions and understand the principal of how the systems work. I wanted to know more, do more, and understand fuller. There weren’t enough of us on the project, so in order to do all those things I had to give up something else. My choice was sleep but not to worry, I would sleep tomorrow. Projects come and go and time passes. While the pain of grief subsides, the wound of loss never heals. It takes effort to find ways to channel the energy associated with loss into something positive and that cost isn’t free. While I love the fact that the Sleep Sack initiative is well underway, one thing clear to me today is that l can’t do it all and I’m grateful for the support that we have found in our friends and family and the dedicated staff at the hospital. At work I have now become the subject matter expert for our technology. I also manage the development programs. There are also sales efforts and customer presentations. While I enjoy the challenge, something clear to me over these last few months is that I simply cannot do it all. The weight of “knowing it all” is simply too much. It’s not healthy for me or the organization and certainly not helpful to the people that I’m entrusted to manage. I’ve also not felt all that well for the last few months. I love helping to coach the boys’ soccer team, but it’s hard to do when you have nearly lost your voice. I’m tired in the evenings more than I ever thought possible, and that says a bit because we do have two wonderful growing boys and I’ve “been there” when it comes to being up half the night with newborns. The ironic thing about all of this is that there was a three month window during these 24 months when I was actually feeling really well. We purchased a treadmill last spring, and when I used it regularly, I was resting well and I felt great. Then I stopped. I know my travel schedule has been rough for the last six months and while that was a contributing factor, I just didn’t give it the time. The truth is I was lazy, and I’m tired of not feeling well. 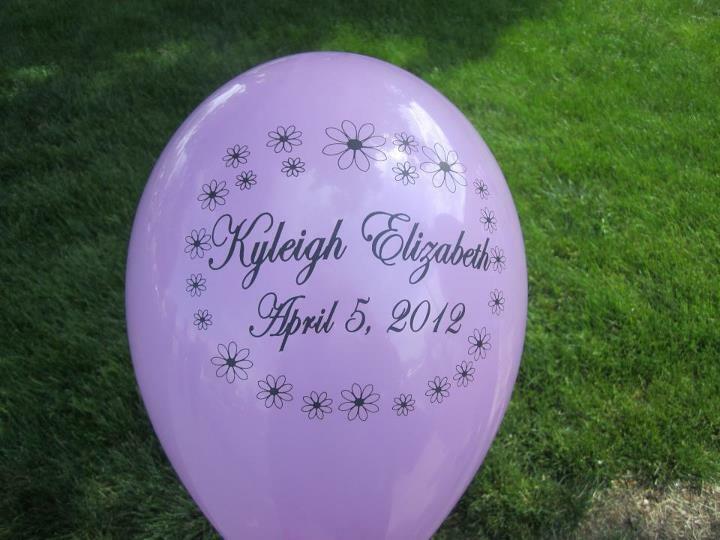 So we’re planning a walk/run to celebrate the Liberty Hospital Birthing Center and raise funds for Kyleigh’s Gift while recognizing the National Pregnancy and Infant Loss Day for October 11th this year. I hope there will be a 5k run, and I want to run. I want to feel better because I know that when I do, I’m a better father and husband to my amazing bride. So today, on Kyleigh’s second birthday, I’m going to start training for the October 11th event, and I will look forward to the amazing things that God will do.